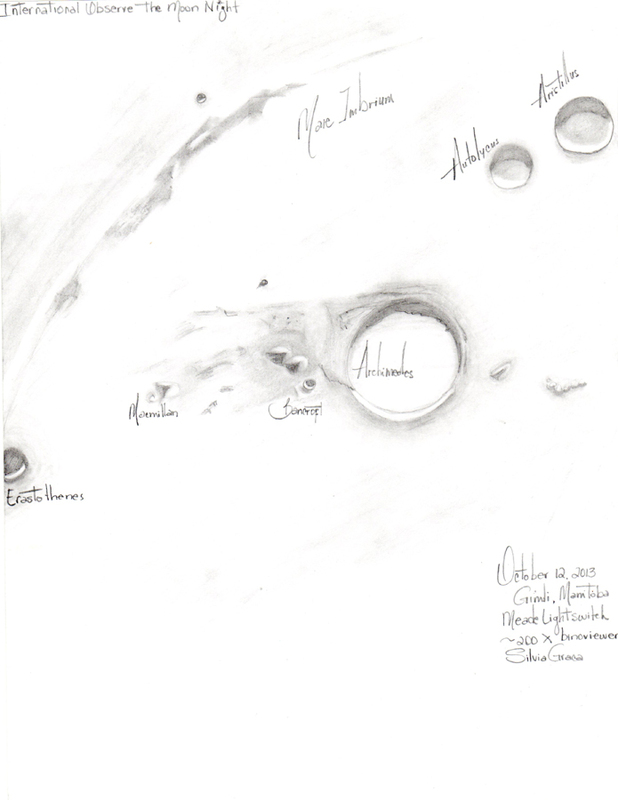 This gallery features the work of members of the RASC Astrosketchers' list. I only had time for one sketch and even that was rushed with many details being left out. I did take time to watch the occultation of Beta Capricornus (Dabih) It was quite some time between the disappearance of the first companion and the second as they are separated by some distance. After they disappeared I went to sketching and didn't notice that they had popped out the other side while I was still sketching. 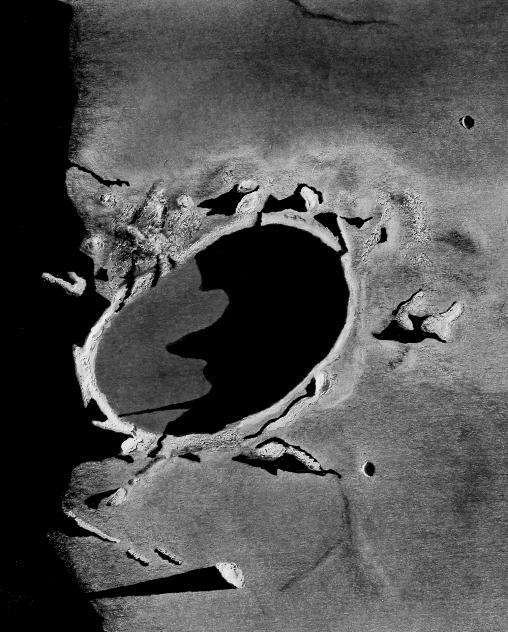 Here's my sketch of the crater Plato that captivated me with that one long thin shadow that stretched right across the smooth floor of the crater. Below Plato, the long shadow of the solitary bright mountain Mons Pico stretched to the terminator. Quite a compelling view. A naked-eye image executed from an overly-lit downtown Toronto parking lot. A naked-eye image executed from an overly-lit downtown Toronto parking lot. The lunar halo was very faint. 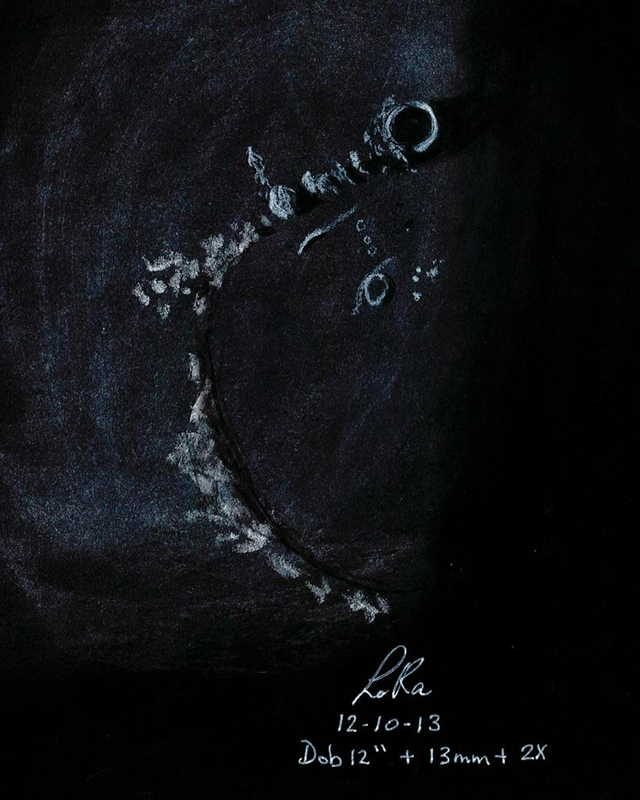 Both sketchs were done with white chalk on black paperboard. 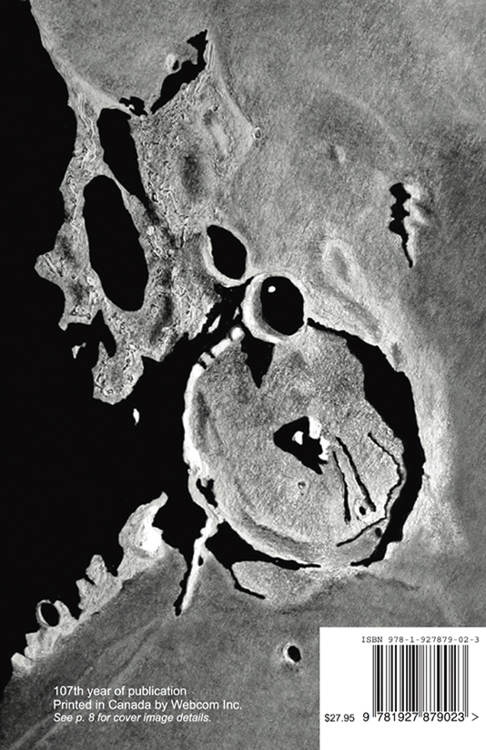 The second one (right) was sketched with the naked eye. Under the editorship of David M.F. Chapman, the RASC Observers' Handbook has featured observational drawings by RASC members on either the front or back covers. 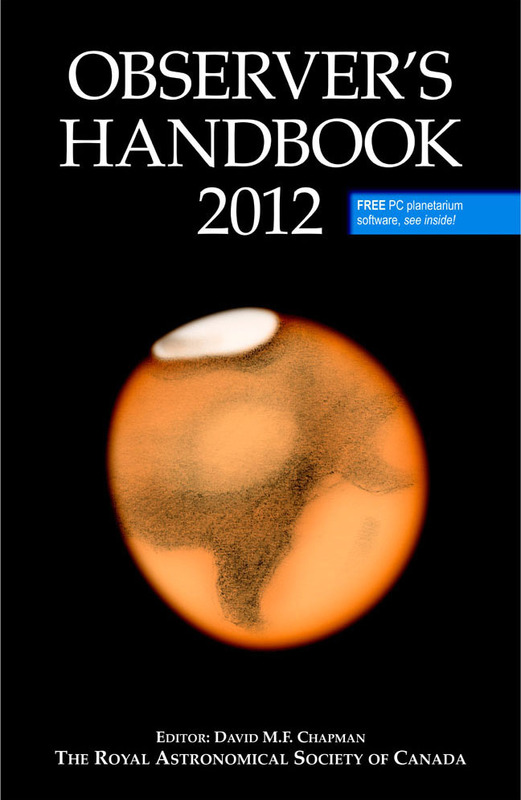 The front cover of the 2012 Handbook displays an excellent depiction of Mars at opposition by Michael Gatto, and the back cover of the 2013 Handbook shows a drawing of the central part of the Great Nebula in Orion (M42) by Kathleen Houston, author of the Handbook's chapter on sketching. 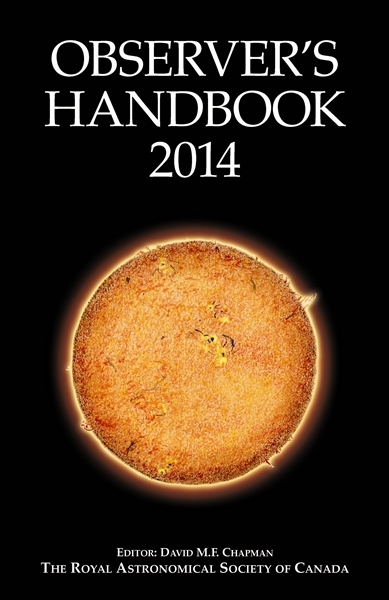 R.A. Rosenfeld's sketch of the Sun in Hα appears on the front of the 2014 Handbook, and Gerry Smerchanski's portrait of the crater Gassendi fills the back cover of the 2015 edition. Alex writes: We were fortunate to have marvellous transparency that summer's night. Seeing was poor, and magnification had to be kept down low. But you take what you get. 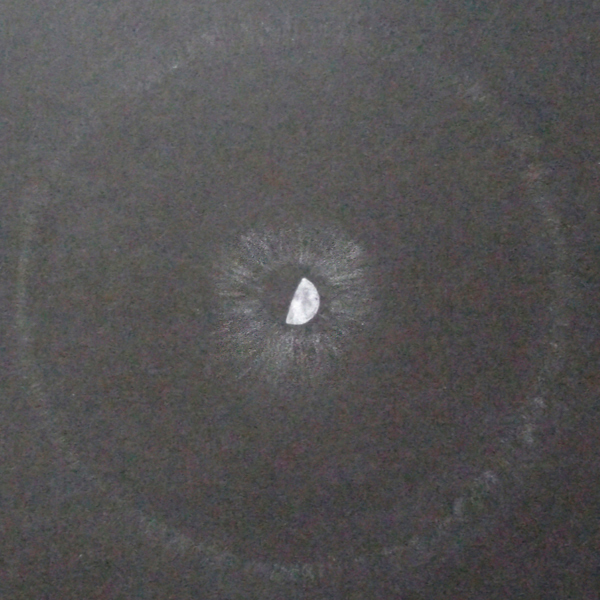 I had not sketched M42 from a dark site before. This night was my chance. And this night's special conditions revealed more detail, subtlety, and extension of nebulosity than I have seen previously. After two hours I was beginning to think to myself "Good grief! When is this going to stop!". One of my favourite parts of this nebula is M42's little companion M43. Its somewhat spiral shape, and faint streamers of material connecting the two is a delight to see and a challenge to depict. I hope you enjoy this piece. It is a sketch that when I see it again after some time always leaves me thinking "Wow! It really was a special night". R.A. Rosenfeld ©R.A. 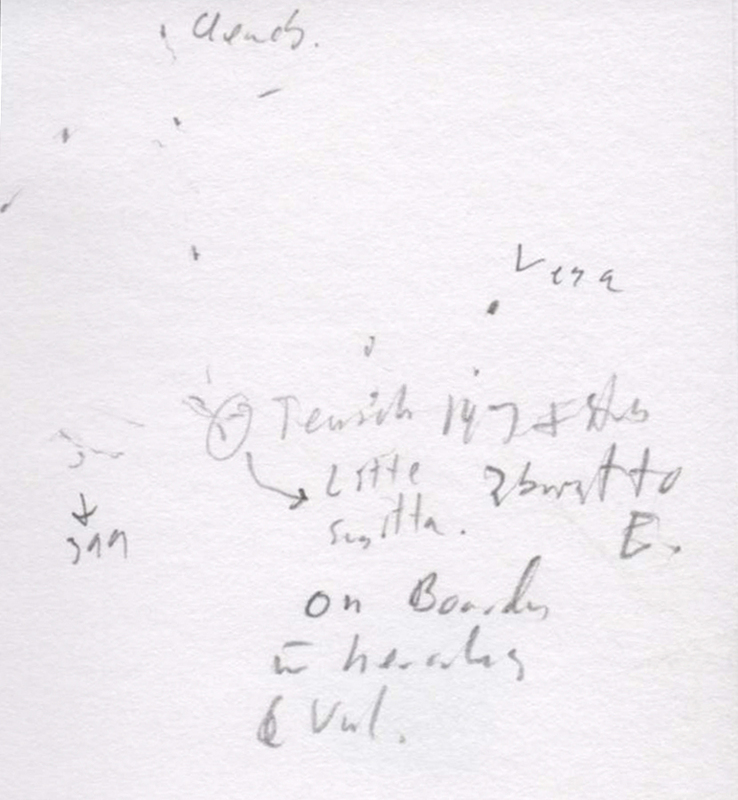 Rosenfeld writes: This is a white-light solar sketch... executedin pencil on paper, in the usual format I favour (the entire sunspot group is 2.54 cm long on the page). R.A. Rosenfeld writes: an impressive filament, large enough to give the impression of 3D effects even when viewed in a modest 40mm O.G. PST . The mistake was to begin the observing session so close to local sunset! 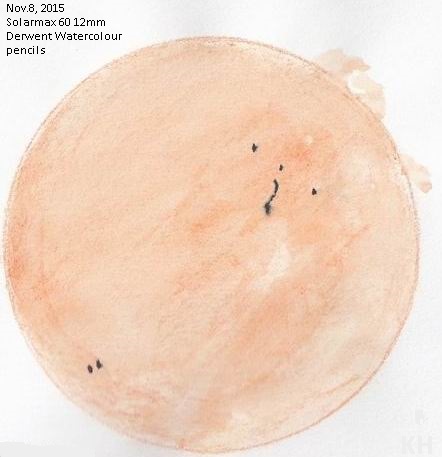 Kim Hay writes: This is a sketch of the Sun done on 2015 November 8 with a Coronado SolarMax 60. It is one of my first essays using Derwent Watercolour pencils. I quite like the effect, and plan on doing more of this today. I also did up a comparison - black vs. white paper, and pastels vs. coloured pencil vs. watercolour pencils. Chris Beckett reports: On 2015 December 7, at 6:30am CST I began observing Venus and the Moon, checking the progress every 30 minutes. 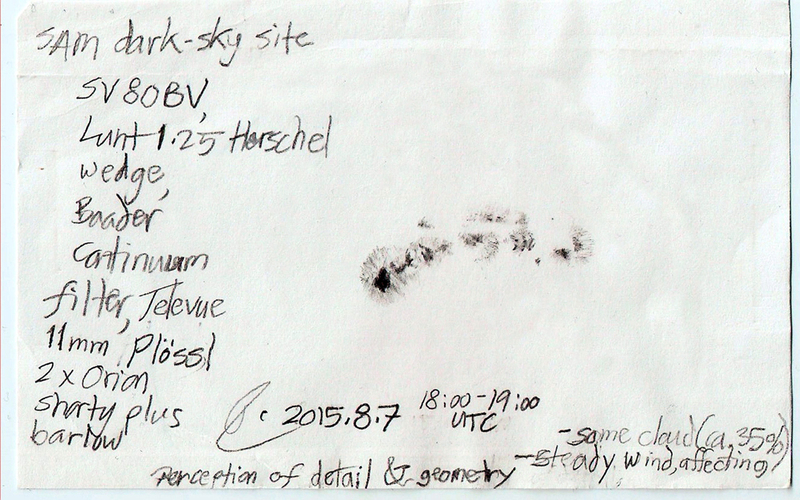 However, the disappearance at ~10:39am was totally obscured by heavy cloud moving in. The cloud eventually thinned, and after some effort I was able to recapture the Moon ~11:40am by using the 3.6-degree field provided by 20X in a 5-inch refractor.  Venus reappeared from my location in East Regina at 11:48am, and the attached, rough, sketch displays it's appearance at 11:50am. As Venus re-emerged the planet popped out but brightness steadily increased, perhaps caused by the heavy cloud but reports indicate a dozen or more seconds were required to fully re-emerge. Venus was much easier to see through heavy cloud than the lunar disk; the low Sun and deep shadows perhaps increased contrast compared to summertime observations. Observing began with the unaided eye at 8:33am CST, the crescent Moon with Venus ~20 degrees to the NW. Sunrise was 8:46, the Moon became challenging shrinking to a slice easily mistaken for a short contrail. 7X35 binoculars were introduced but the Moon was easily held with the unaided eye until 8:58. A fast approaching high cirrus cloud entered the binocular field so I decided to hold on until the Moon was obscured. The cloud moved over the lunar sliver, however, instead of a disappearing act it became iridescent, lowering the binoculars this enhanced crescent Moon was seen naked eye behind the thin high cirrus cloud, the sliver was lost at 9:12am. New Moon is at 4:29am tomorrow making this a 27.9 day old Moon, 19hrs and 17 minutes before new. Please see attached a sketch, the Sun was ~3-degrees above the horizon peeking between a building and stand of trees while the Moon and Venus remained visible to the unaided eye. There were low level heavy clouds near the Sun, but not in my line of sight, my guess is the low clouds were positioned in such a way to allow the Moon to back light the high cirrus. 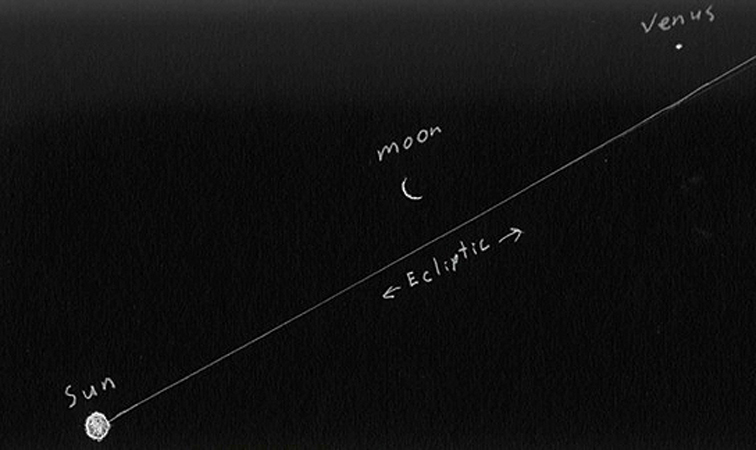 Note: through 7X35 binoculars the Moon was a slim arc of 5 uneven segments, the brightest, and largest, pointing towards the sun and the other sections progressive dimmer on ea. side, the brightest pointing directly at the Sun. I have a sketch of this as well but it's rather poor. This summer in Grasslands National Park I set out to make a naked eye sketch of Al Sufi's cluster, aka The Coathanger Cluster in Vulpecula. 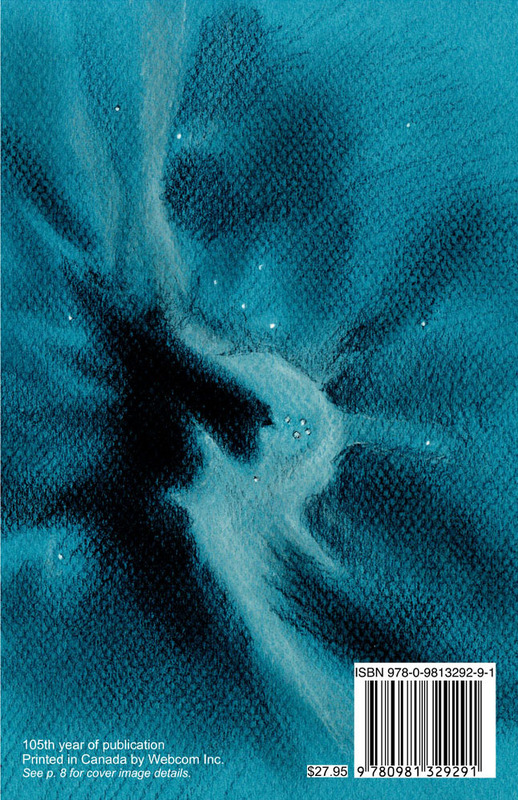 Software and digital imaging often do not represent what the eye alone sees as the haziness caused by unresolved stars, the atmosphere, and imperfections of the human eye. Collinder 399 was discovered without optical aid by Persian Astronomer Al Sufi who described this nebulous haze in 964 AD. Re-discovered by several astronomers "The Coathanger Cluster" is an asterism and not a true cluster. Popular among amateur astronomers because one can easily see the Coathanger without optical aid and the 8 brightest stars. 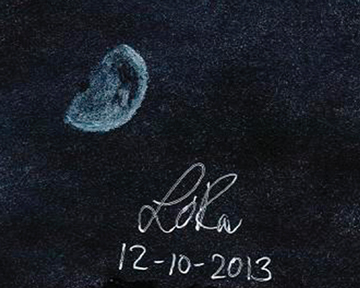 Nearby I noticed a fuzzy line, appearing much as the "bar" does in the Coathanger but part way between Vulpecula and Lyra so I sketched the attached and looked it up the next day. 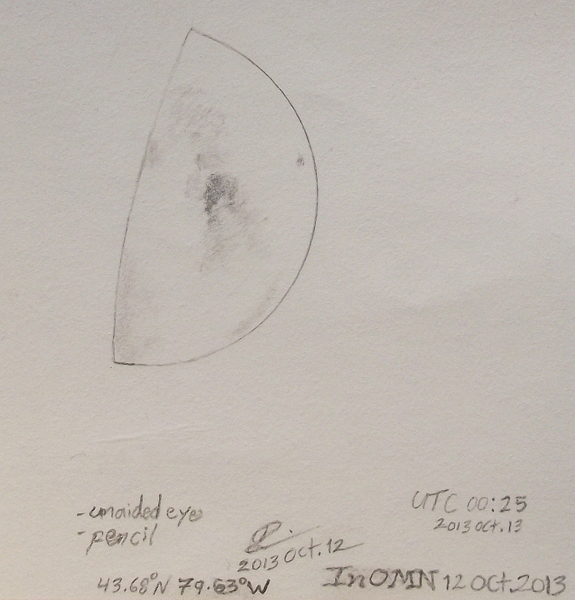 I could make out two stars embedded in haze and a granularity to a hazy bulb at the end, see attached sketch. Teutsch 147 was discovered about 12 years ago by Phillip Teutsch as part of the Deepskyhunters collaborative effort between a group of dedicated amateur astronomer & professional observations. The work is a systematic survey of selected Milky Way fields based on the visual inspection of DSS and 2MASS images and has resulted in many new asterism, cluster and galaxy discoveries. 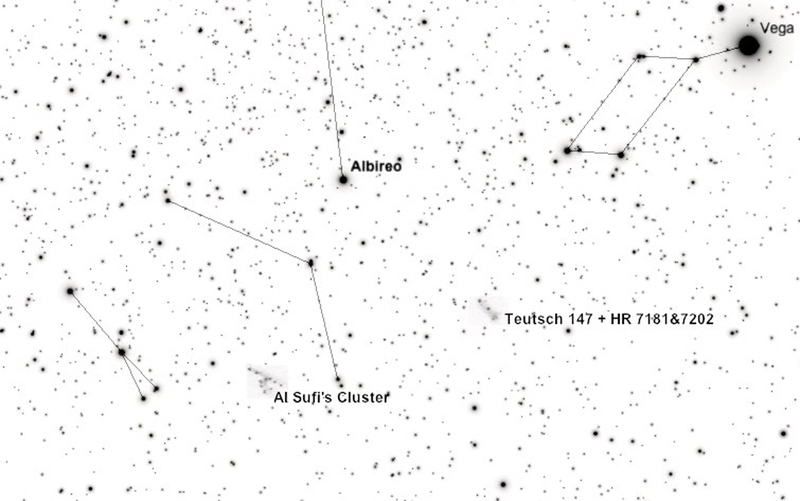 Unlike Al Sufi's above, Teutsch 147 may be a real cluster. There are five 6th magnitude and three 5th magnitude stars in the Coathanger and the two bright stars northeast of Teusch 147 are 5.3 & 5.7 respectively and the cluster has one 7.4 magnitude stars with others in the 8th-10th magnitude. So from a dark sky, in one glance, and without optics, we can observe two clusters, one among the oldest known, discovered over 1,000 years ago, 600 years before the telescope, the other among recent discoveries made using digital technologies. Attachment Note: Tonight I scanned the clusters from my sketch pad, originals were created using 2B, 4H & Charcoal blending, and were overlaid into output from SkySafari Planetarium software using Mac Previewer, the most basic of graphical tools. I had not intended to present this way but when I imported the sketch I cut the clusters out to see how accurate they were and the stars from the sketches nearly perfectly lined up over the ones in the software! 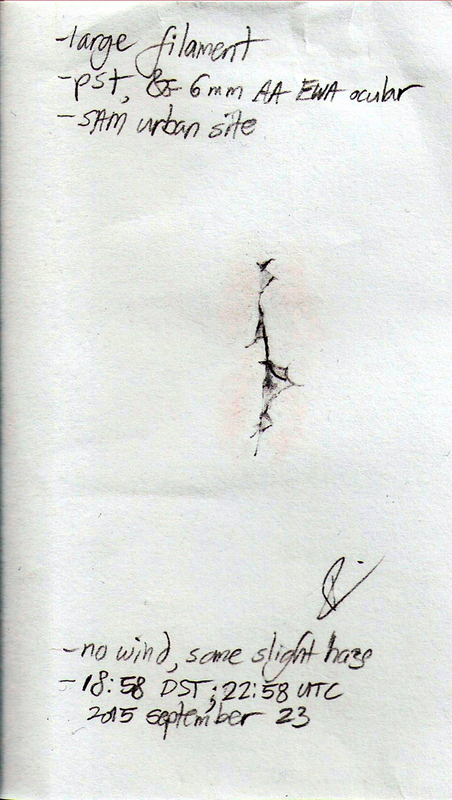 This gallery is curated by R.A. Rosenfeld for the Astroketchers' list.